This is my trip report of a Burma scuba diving liveaboard on the MV Jazz in January 2009. Parts 1 and 2 cover the actual Myanmar dive sites, and Part 3 is a rundown of what the MV Jazz is like as a boat. UPDATE: the MV Jazz is no longer operating. We recommend diving Burma with MV Dolphin Queen. Currently all Burma liveaboards depart from Thailand and cross over into Burma, clearing immigration along the way. The MV Jazz Burma trip began with a 4 hour minivan transfer from Phuket Airport to the Thai border town of Ranong, from where the MV Jazz would depart. We arrived at a seafood restaurant near the pier just before sundown for some Thai food and beer while the boat arrived from its previous trip in the Similan Islands. Once on the boat, everyone handed over their passports, $200 US cash, 4 passport photos and photocopies of their passport information pages to the MV Jazz staff. These which were then presented to the Burmese immigration officers who came on board once the boat had crossed from Ranong to the Myanmar town of Kaw Thung. The guests didn’t have to do anything during this process – the immigration officials are used to the MV Jazz making regular trips and so entry into Burma is expedited. Once that was done, it was an overnight sail to our first dive site. 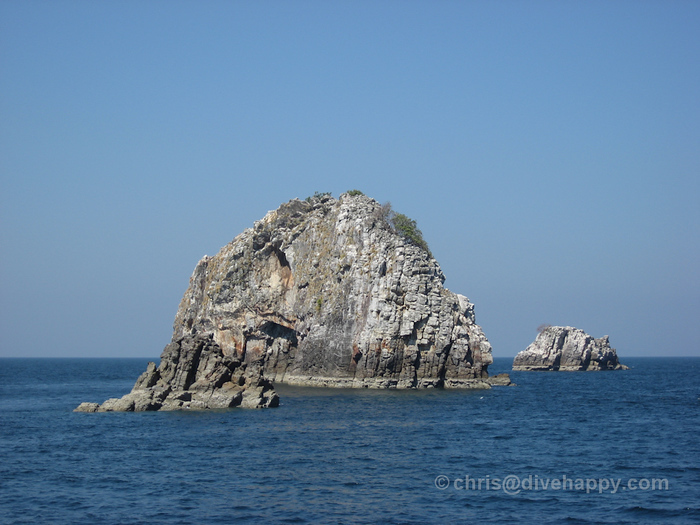 The dive site Eagle’s Nest is a great introduction to Burma diving – the blasted limestone rock rises out of the ocean with nothing else around it, with birds of prey wheeling around. It’s quite desolate looking, but also quite beautiful – a real contrast to the Similan Islands. The water is greener and colder too – it hovered between 28 and a bum numbing 25 degrees. Once underwater, the limestone rocks appear purplish and are blocky and jagged, like huge great slabs leaning together. After spotting a couple of octopus skittering across the reef and a huge stingray lurking under a rock, along with the ever present moray eels lurking in the limestone cracks and clownfish on the carpets of anemones, we had an awesome to finale to the first dive – a close encounter with a leopard shark, which are usually very shy of divers, but this one decided to get up close and personal – see the video. 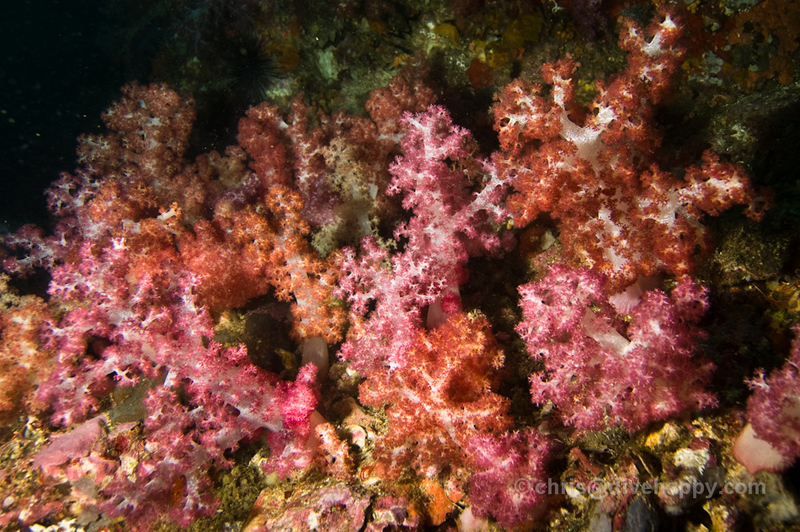 For the first couple of days, we were not blessed with very good visibility, but it didn’t really matter – the soft coral that covers many of Burma’s sites is abundant and brightly coloured, and the size of the sea fans at some of the sites, like the obviously named Fan Forest Pinnacle, are just breathtaking. Many are more than a couple of metres wide and tall, bigger than a diver, and are all sorts of colours, from electric orange to delicate pink. The sea fans and soft corals can really save the day on some dives – Twin Cheeks is a submerged pinnacle that doesn’t begin until 12 metres, and there’s not much to see above 20 metres – it’s a fairly featureless plain (“like the upturned hull of the Kaiser Wilhelm” as one wreck enthusiast mournfully put it). Veer below 20 metres where the pinnacle slopes steeply and you suddenly encounter a riot of colour, as fans explode from the incline and soft corals cover the rocks. It reminded me a little of Triton Bay, where the viz is also famously bad but no impediment to enjoying the colours of the corals. Tunnels are a characteristic of Burma diving as the sea has eroded through the limestone rocks – Crayfish Cave is a particularly good example, which is a 15 metre or so tunnel that goes right through to the other side of the dive site, and is home to some impressively large crayfish. Several of the sites we visited had swimthroughs, ravines and tunnels, with the most spectacular being at In Through The Out Door, which we arrived at on Day 3. One dispiriting thing we witnessed on several dive sites was a few dead fish scattered across the reef, the fallout of dynamite fishing that had been carried out several miles away from where we were diving. The Burmese fishermen had all but stopped using dynamite in the last 3-4 years – I saw no evidence of it on last year’s Burma trip, for example – but this time round we saw undeniable evidence. Things came to a head when we arrived at Pygmy Palm Pinnacle towards the end of the second day to see a huge plume of water erupt into the air as we approached the site – there were fishermen already there dropping bombs on the reef. When we looked closely at the photos of one of the boats afterwards, we saw the distinct shape of a shark fin poking out from beneath a tarpaulin. Tour leaders Ric and Clive set about taking photos of the two fishing boats we saw there and the Thai staff on board tried to find out more info about the boats, so as to report them to the Burmese authorities on our return to Kaw Thung. It was clearly dangerous to dive anywhere near these boats, so the Jazz diverted to another site which turned out to be not much fun due to a strong current. It’s difficult to say whether this is just a small resurgence or the beginning of a full scale dynamite fishing campaign that will ruin Burma’s reefs again. It’s only through dive liveaboards visiting this area that these activities – and the damage to the reef – can be witnessed and recorded and reported to the relevant authorities. One thing that becomes apparent from looking at the primitive equipment the fishermen use is how easy it is for a small group of men with little gear to cause a lot of damage very quickly to the reefs. This is Part 2 of my Burma diving liveaboard trip report in January 2009. Part 1 is here, and Part 3 is a review of the MV Jazz liveaboard. On Day 3 we arrived at the furthest point of our trip, the 3 Islets, where Burma’s best dive site is located – In Through The Out Door. I remembered this place being spectacular from last year, both for its underwater topography – a stunning underwater ravine leading into a small tunnel before emerging onto a sloping reef – and for its teeming wildlife. I also remembered the viz being much better here than on the southern sites. As such, my heart sank a bit when we jumped in and the initial viz was super murky – it was about 3 metres max! However, once Clive located the entrance to the ravine, the viz immediately improved – and apparently this is almost always the case. Inside the opening of the ravine we found a massive Jenkins ray lurking under a rock and several beautiful nudibranches on the walls, before entering into the narrowest section. This area is around 15 metres deep and the light filters through from above, framed by the canyon’s wall and home to an vast school of fish – absolutely breathtaking. Beyond the narrow part of the ravine lies the very short tunnel, which emerges after a few metres onto the reef. This is a simple slope that is clouded with lots of glassfish and the other usual tropical suspects, plus a lot of scorpionfish – you have to be careful any time you are taking a photo – and hordes of morays. A carpet of anemones billowed across the rocks, cuttlefish weaved in and out of the sea fans along with juvenile sweetlips doing their high-energy jitter. There’s so much going on that one dive is simply not enough to see it all, so doing the following dive in reverse (Out Through The In Door) also worked well. We fitted in a couple of hours at an idyllic beach on Kyunn Phi Lar island a short cruise away from the 3 Islets. Once through the ravine and back onto the reef, things calmed down a bit and we had a chance to look for yellow morays out hunting and getting cleaned by giant cleaner shrimp – most divers were, I think, still getting their breath back from the barracuda encounter. Our luck with the better visibility continued the next day at High Rock, where we did our last two dives of the trip. A photographer’s favourite thanks to the tree that continues to cling tenaciously to the top, High Rock is a simple, circular dive site which flattens out onto a sandy bottom around 20 metres. It was here we found some fantastic luck finding macro critters – Clive found not one but two pineapple fish, elusive little critters that are very shy. Ayesha spotted a yellow seahorse thanks to it standing out on against a green coral background, while two huge nudis were also spotted on the slopes as we first descended. On the safety stop, I found this photogenic porcelain crab lurking amongst an anemone – a great finale to our Burma dive trip. We were all up by 12 noon, and then began the long cruise back to Kaw Thaung. We arrived there around 4.30 pm, where we all disembarked while the MV Jazz staff cleared our passports with Burmese immigration. There’s not much to do in Kaw Thaung so most of us elected to go and try the local Myanmar brew. After that, it was back on the boat to cross back into Thai waters and then sail overnight to Khao Lak, our final point of disembarkation. After breakfast the next morning, we got out at Tapla Mu pier around 8am and from there took the taxi to Phuket Airport. All in all, I greatly enjoyed my second Burma trip. The dynamite fishers put a bit of a damper on things, and the cold showers didn’t help, but Burma has something unique going for it that despite its occasionally challenging conditions makes it interesting to explore. Here’s hoping the Burmese authorities crack down on illegal fishing and let Burma’s reefs continue to regenerate and encourage further discovery from Thailand liveaboards in the future. Me (centre) with dive guides Clive and Ric: ba-dum ching! UPDATE: the MV Jazz is sadly no longer operating. We recommend diving Burma with MV Dolphin Queen. MV Jazz is a liveaboard for 14 people operating in Thailand’s Similan Islands and Burma. It’s one of a handful of Thailand-based liveaboards to make the journey into Burma. The MV Jazz had not changed that much from my previous Burma trip on it a year ago. There was the welcome addition of a small camera table with power chargers (3 110 volts, 3 220 volts) and also a computer desk with PC system and monitor. The cabins with ensuite toilets and showers are fairly spacious. There are a couple of double bed cabins and several twin bunk cabins. There is a big enclosed lounge, which was used as a sleeping area for a couple of people and a storage space for everyone’s luggage, along with setup for cameras on the aforementioned camera table. Towels are provided but rooms are not cleaned each day. There was the occasional whiff of diesel in the front bow cabins on the first night, but that disappeared. Unfortunately, on our trip the hot water heating for the showers was not working properly and the air conditioning, which is centrally controlled for most cabins, was somewhat arctic, although that could be good or bad depending on your fondness for AC. Most people hung out on the mess deck at the back of the deck, which had plenty of room for a full boat of 14 people, and also the sundeck at the front, along with the couple of hammocks strung from the railings. The two Thai cooks Pee Mai and Pee Soo came up with a uniformly excellent selection of Thai and Western food throughout the trip, created in their tiny kitchen under the dive deck and then brought up to the mess deck through an ingenious dumb waiter system. The Jazz follows the time-honoured liveaboard timetable of Eat Sleep Dive, and the two cooks made sure there was a mini breakfast before the first dive, full breakfast after it, then lunch after dive 2, then snacks after dive 3, and then dinner after dive 4. They also provide Thai Massage at 300 Baht for 1 hour. Beers (Chang, Singha and Tiger) are all available on board at around 50 Baht a can, along with the usual soft drinks. There’s no wine or anything posh, so bring your own if required. Water, tea, coffee, Ovaltine etc are all free. Orange juice and fresh fruit (pineapple, watermelon, bananas) are provided with most meals, and there are always clementines and bananas available. The MV Jazz has a very nice dive deck, with lots of space for all 14 divers plus staff to gear up. Dive teams are staggered so only half the guests are gearing up at any one time. The boat boys are excellent and proactive at helping you on and off with your gear and passing cameras into the water. All dives are done as giant stride entries from the back of the boat. You need to get ready and be waiting at the back of the boat for the captain’s blast on the horn as the signal to jump. It’s important to note that diving in Burma means encountering low visibility and strong currents from time to time – if you are not comfortable diving in these conditions, you might want to reconsider doing a Burma trip. Nitrox is available at 200 Baht per tank. The MV Jazz is a good choice if you want to go to Burma on a budget, although it’s still not cheap like a Similans trip. It was a pity the showers weren’t working properly but this should be rectified very soon. The very cold air con was not to my taste either but it was hardly a showstopper. The food and great crew were two big pluses to the trip and I’ll certainly be going back again on the Jazz next year.